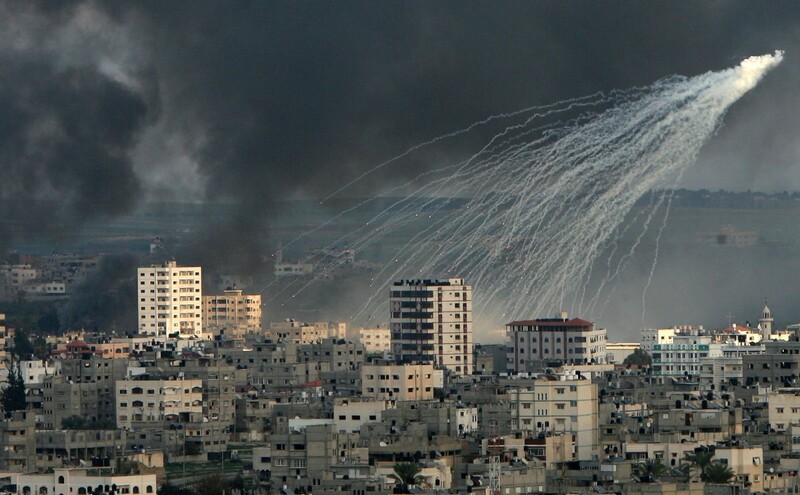 Israeli white phosphorus shells over Gaza, 2009. June 2017 marks two grim milestones for Palestine: 10 years of closure of the Gaza Strip and 50 years of occupation. Although Israel imposed movement restrictions on people and goods in Gaza since the 1990s, they intensified in June 2007, following Israel’s response to the democratic election of Hamas. Since then, Israel closed off Gaza by land, sea, and air, prohibiting entry into and exit from the Gaza Strip. The ten years of closure has created a man-made humanitarian crisis: 80 per cent of Gazans are now dependent on humanitarian aid, while poverty and unemployment rates have soared to over 40 per cent. Meanwhile, one million Palestinians are currently food insecure — over half of the 1.9 million total population. The humanitarian crisis has been further aggravated by three Israeli military assaults against the Gaza Strip. During the 2014 Israeli offensive, much of Gaza’s infrastructure was destroyed including water, electricity, and sewage. Israel has continued to prevent the entry of building materials and machinery into the Gaza Strip, making efforts to completely rebuild from all three military assaults slow and costly. Today, Israel’s full closure regime represents a brutal act of collective punishment against Palestinians in violation of international law. This has directly impacted the economy and the provision of electricity, water, and sanitation, while destroying key sources of employment such as agriculture in the buffer zone and fishing in the maritime zone at sea. In addition, the closure system of exit travel permits has directly impacted access to healthcare resulting in violations of the rights to health and life. Palestinians in Gaza experience extreme daily hardship, with the UN reporting that the Gaza Strip will be uninhabitable by 2020. Such an ominous forecast is the result of Israel’s policy of ‘de-development’. Israel only permits imports of ‘basic humanitarian products’ into the Gaza Strip and prohibits exports and transfers of goods to the West Bank. The policy has crippled the Gazan economy turning it into a captive market, dependent on Israel for food and other products. Israel has deliberately reduced Gaza’s electricity supply with electricity outages currently lasting up to 20 hours a day. On 11 June 2017, Israel’s Security Cabinet decided to further cut electricity to Gaza by 2 hours. While reports state that the move comes after the Palestinian Authority decided to reduce Gaza’s electricity funding, Israel ultimately holds responsibility for the provision of electricity as occupying power. Yasser, at the time 11, was injured by a live bullet during internal hostilities in 2007. The injury caused Yasser to become quadriplegic, and he required the continuous use of a ventilator due to respiratory failure. In 2008, Yasser was eventually released from hospital treatment after his father received a ventilator through a Swiss donor. At the time Gaza was facing electricity cuts for more than 16 hours a day. Although Yasser’s father invested in a generator, it could not work for more than 4 hours a day. During the electricity cuts, Yasser’s parents would use a manual pump to ensure their son could breath. Since 2000, Israel has restricted access to border lands in Gaza. It is estimated that around 35 per cent of Gaza’s cultivable land is within the so-called ‘buffer zone’. Israel enforces the buffer zone by leveling farmland, damaging property, and infrastructure/structures therein, and destroying crops. Although not an isolated occurrence, in April 2015, Israel sprayed the buffer zone area with an unknown pesticide, burning and damaging the crops of Palestinian farmers in the area. Palestinian farmers and other civilians working in the border area have been shot at, and in some cases killed, by the Israeli Occupying Forces (IOF). As with other areas of the economy, the agricultural sector is unable to fully recover due to the closure. The Office of the Quartet reported that Israel’s 2014 assault on Gaza destroyed or badly damaged 220 agricultural wells, and caused $550 million USD in damage to the agricultural sector. Such damage is then exacerbated by the inability of farmers to attain fertilizers, pesticides, necessary equipment, and other materials due to the closure. Under the Israeli-Palestinian Interim Agreement on the West Bank and the Gaza Strip, Palestine has an agreed maritime zone (Zone L) stretching 20 nautical miles (nm) along the Gaza coast, designated exclusively for ‘fishing, recreation, and economic activities.’ In 2000, Israel unilaterally and unlawfully decreased Zone L to 6nm to secure Israeli gas fields in the nearby Mari-B field. The fishing zone is currently restricted at 9 nm from Rafah to Gaza City port, and from Gaza City port to the northern border at 6nm. Israel targets the lives and livelihoods of Palestinian fishermen in the Gaza Strip. While at sea, Palestinian fishermen from Gaza are continuously at risk of being detained or killed by the IOF under the guise of ‘security.’ One of the most recent attacks on Palestinian fishermen took place on 15 May 2017, resulting in the death of Mohammad Majid Fadil Bakir. Mohammad had been fishing within the imposed fishing zone along with his two brothers Fadi and Omran, when Israeli naval forces began chasing and firing live and rubber ammunition at the brothers and their boat. Although the fishermen posed no threat, the IOF killed Mohammad shooting him in the chest at close range. The IOF also destroyed the motor on the brothers’ boat. The closure and Israeli assaults on Gaza have severely impacted access to healthcare. Excessive power cuts and fuel shortages threaten to close down essential services in Gaza’s fourteen public hospitals. With sometimes as little as six hours of electricity a day, sensitive medical equipment including heart monitors, incubators, sterilization equipment, X-Ray, MRI, and ultrasound machines cannot function properly. Largely as a result of the lack of medical equipment and of needed pharmaceuticals, the last five years have seen a 34 per cent increase in medical cases referred for treatment outside of the Gaza Strip. Although medical referrals have significantly increased, Israel has reduced exit permits for healthcare from 92.5 per cent in 2012 to 44 per cent by October 2016. As with other policies, Israel arbitrarily uses security as a pretext to deny medical travel permits without explanation. Patients or patient-companions are required to attend security interviews as a condition for obtaining a travel permit. On 17 April 2017, 5-year-old Aya, who suffered from cerebral palsy since birth, died after repeated permit denials from Israeli authorities for appointments between February and April 2017. Aya’s health continued to deteriorate with each missed appointment, until her passing. Al-Haq has also documented cases where Israeli authorities regularly attempt to coerce patients or their companions into collaborating in exchange for permission to travel. Ahmed Shubeir, 17, was born with congenital heart disease and required treatment outside of Gaza. While his health was deteriorating, he was summoned by Israeli intelligence and told,“we know that your health condition is very difficult and we are ready to […] give you the best doctors in exchange for your cooperation with us.” When he refused, Ahmed’s mother was then asked to collaborate; she also refused. On 14 January 2017, Ahmed passed away in Gaza. Israel’s ten-year closure of the Gaza Strip is part of its broader policy of fragmenting Palestinian territory and obstructing the right of Palestinians to self-determination. Israel has placed arbitrary and repressive restrictions on the freedom of movement of Palestinians between the Gaza Strip and the West Bank, including East Jerusalem, in an effort to divide Palestinians and conquer Palestinian lands. For 50 years, the international community has failed to intervene to end Israel’s ‘divide and conquer’ military operation allowing Israel to continue its aggressive expropriation of land and colonisation of the OPT. The international community must now take action to end the 10 year closure of Gaza and 50 year occupation of the OPT, tear down the annexation wall, so that the territory of Palestine and the Palestinian people are united. General Assembly, Situation of human rights in the Palestinian territories occupied since 1967, Note by the Secretary-General, 19 October 2016, UN Doc A/71/554, para. 45.
 WHO, “Health conditions in the occupied Palestinian territory, including east Jerusalem, and in the occupied Syrian Golan, 69th World Health Assembly” (20 May 2016), UN Doc A69/INF./6. UNCTAD, “Report on UNCTAD assistance to the Palestinian people: Developments in the economy of the Occupied Palestinian Territory” (6 July 2015) 11. UNCTAD, “Report on UNCTAD assistance to the Palestinian people: Developments in the economy of the Occupied Palestinian Territory” (6 July 2015) 13. Susan Power, “Israel’s Deadly Catch: Special Report for United Nations Business and Human Rights Forum 2015 on the Persecution of Fishermen in the Occupied Palestinian Territory” (Al-Haq 2015) 30. Al-Haq Field Affidavit №4493/2008 (25 November 2008). UNSCO, “Report to the Ad Hoc Liaison Committee” (01 May 2017), pp. 5, 9, 19, 20, and 24. Information provided by Al-Mezan on 19 June 2017. Al-Haq Affidavit №240/2017 (17 May 2017). WHO, “Health conditions in the occupied Palestinian territory, including east Jerusalem, and in the occupied Syrian Golan, 69th World Health Assembly” (20 May 2016), UN Doc A69/INF./6, Annex: The Health Conditions of the Population of Occupied Palestine”, Report submitted by H.E. Dr. Jawad Awwad, Minister of Health of the State of Palestine, para. 157.
 WHO, “Right to health: Crossing barriers to access health in the occupied Palestinian territory 2014–2015” (WHO 2016) 18. (n 28) 21 and 27. Al-Haq Affidavit №290/2017 collected from Aya’s father, Ghaleb Khalil Abdel Salam Abu Mutlaq, a resident of Abasan al-Kabira east of Khan Younis in the Gaza Strip, on 26 April 2017. Under Israeli law, a minor is required to travel with a companion. WHO, “Referral of Patients from Gaza: Data and Commentary for 2010” (WHO oPt 2011) 18. Al-Haq Affidavit №30/2017, given by Hassan Jamil Anees Shubeir, Ahmed’s father, on 24 January 2017, 10 days after the death of his son. Al-Haq Affidavit №310/2017 collected from Yousef Adel Abdel Qader Al-Ghurabli, a resident of Al-Sayamat neighbourhood in Rafah, Gaza Strip, on 06 May 2017.